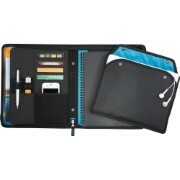 The Zoom JournalBook provides all of the essentials for the technology driven person on the move. Zippered closure. Removable sleeve fits all iPads. We would love to help you with a custom quote. Mention NOTTAGE-ZM1001BK. Just call 1800 674 722 or get a custom quote.